At a bookstore devoted to the works of Kim Il Sung and Kim Jong Il, I stumbled across an essay, from the latter if I remember correctly, about social scientists’ commitment to the revolution and juche. It included the title line – that we must avoid ‘flunkeyism’ toward ‘bourgeois’ forms. We are supposed to contribute to revolution, not critique too much, and not ‘ape’ western ideas. There is an endless debate over the ‘real’ nature of NK – is it a gangster state? A neo-Confucian kingdom? A typical stalinist half of a country divided by the Cold War? Semi-fascist? Presumably the answer is some mix of all that, but what really struck me in-country was the personality cult. Back in April Kim Jong Un referred to NK as “Kim Il Sung nation,” and that is certainly what they showed us. 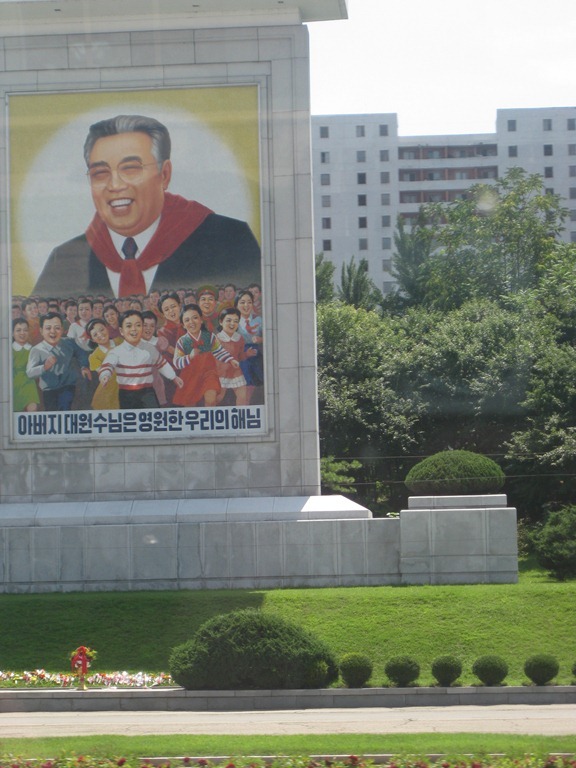 The Kims, especially KIS, were all over the place – statues, placards, and their names on one institution after another. One defining moment came as I was catching up to our guide, and I walked past a large stadium in Pyongyang. Forgetting where I was for a moment, I asked what it was called, only to be told it was Kim Il Sung Stadium. By this time, after a week in-country, one of my friends in the group looked at me like I had a hole in my head. Of course, it’s KIS stadium – my juche spirit was flagging momentarily. So if had to answer the ‘what is NK really’ question, I would say a royalist, absolutist cult. It felt like France before the revolution, when whether or not Louis XIV clipped his fingernails that morning was a more important political moment than whether or not peasants were starving somewhere. From all the statues and placards, as well as the relentless Kim-focused presentations by all of our guides – without exception – the dominant ideology was the personal awesomeness and perfection of the two preceding Kims. KIS as something like Jesus Christ seemed far more important that Marxism, juche, and the rest of it. Two examples really stick out. At a bowling alley, the ball and pins which KIS bowled on the facility’s opening were kept under glass at the entrance, surrounded by flowers, with photos and a dedicatory statement from KIS inscribed on the wall. At a museum dedicated to the construction of the Pyongyang metro, the entire presentation was focused on KIS’ on-the-spot guidance of the construction, not the metro itself. The museum should have been called the “KIS Visits the Metro” museum. A steel cup from which KIS had drunk while visiting the construction had been retained under glass (insert juche holy grail reference here), as well as the subway seat on which he sat on its opening (it had been cut out of the car to seal under glass). Huge pictures throughout showed KIS smiling and pointing, and the guide made a point to tell us how the subway ran better because of his guidance. That guidance included installing ventilation and flood control, because I guess NK engineers thought a flooded, unventilated subway system would be a great success. Good thing KIS was around to point out such subtle improvements. After seeing so many places where the Kims sat or stood or pointed, I asked semi-seriously if we would eventually visit the KIS bench museum. I could go on like this for pages, but in short, wherever possible, the magnificence of the Kims, especially KIS , was emphasized. Busts, statues, murals, and slogans were everywhere. “Long live the great Korean leader comrade KIS!” was the standard. All this was far more emphasized than ideology, the revolution, juche, Marxism, the party, songun, even unification. 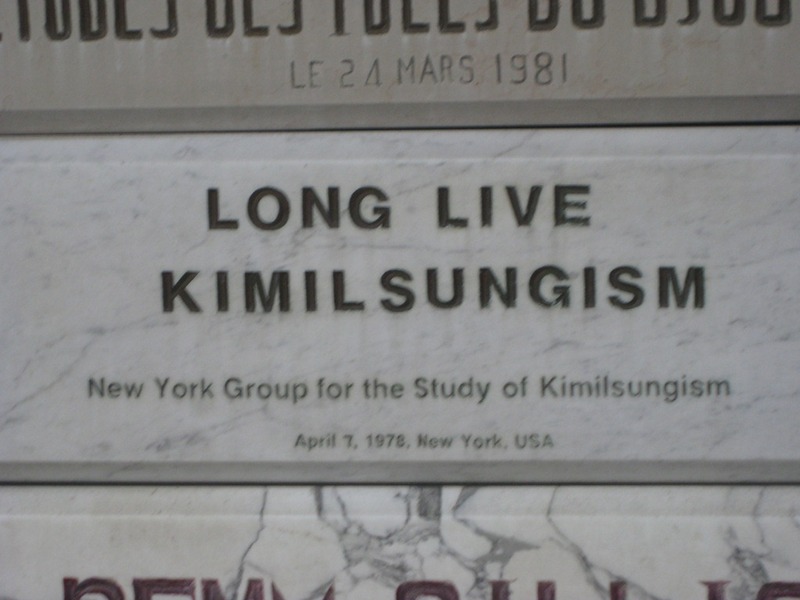 At the Juche tower, several dedicatory plaques just gave up and referred to “Kim Il Sungism,” which dispensing of the fatiguing ideological posturing I found strangely refreshing. At the Juche section of the ‘Three Revolutions Museum,” we learned that Kim Il Sung wrote 18,300 books (that figure is even inscribed on the wall in a huge plaque). What can you even say at point? To me it all looked a lot like evangelical Christianity’s intense focus on the person of Jesus, except in the language of a political-stalinist personality cult. A good book on religion in Korea even makes this argument about the North. Deification doesn’t strike me as particularly Confucian, Korean, or Marxist. KIS’s mother was a Christian, so perhaps that is where it came from. Now there’s some flunkeyism for you. 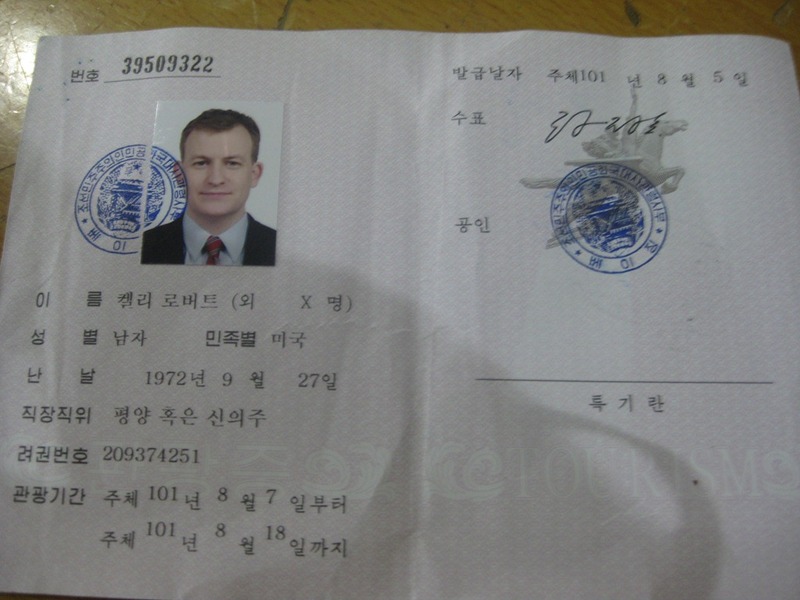 This entry was posted in Korea (North) by Robert E Kelly. Bookmark the permalink. Welcome back. Enjoy the blog. They take tourists to bowling alleys? North Korea really is weird. It most definitely is. But to be fair, I think they were taking us there for a break. That said, it was pretty creepy how ideology even manages to penetrate everyday entertainment. Thanks for reading. That’s funny to some extent. And the situation in NK reminds me of the Great Cultural Revolution in China. Although i haven’t been in that period for a moment, but we Chinese students have learnt a lot since primary school. So, it is familiar to us, but also unacceptable and dread. I heard from my teacher who study in NK that NK is going to have a revolution in 2012, like what happened in China in 1980s. Well, maybe it will come true one day~ But it is still too difficult to imagine that kind of revolution, right? I thought that too. I thought NK might be like China during the Cultural Revolution. I do think big internal changes in NK are unlikely. If NK changes too much, i.e., becomes a lot less communist like China has, then these changes raise the hard question why NK exists at all. So I think too much change is probably not going to happen. Actually i don’t really understand what you mean by “why NK exists at all”. Do you mean that if so, the ROK will reunify the korean peninsula? And the NK exists because of its communist? But, what about mainland China and Taiwan? I believe that there are much in common between this two issues. I do think that the PRC have changed a lot, especially in economy, but the politics in PRC is still so communist and undemocratic. And Taiwan, it has had much more successful revolution in economy as well as politics.To some extent, maybe we can say that Taiwan is superior to mainland China. But it can not reunify China. I mean that NK has no raison d’etre distinct from SK if it simply looks like a poorer version of SK. If NK becomes non-communist, like China has, then there’s no reason for it to exist as a separate Korean state. It should just give up and join its richer twin. This is was what East Germany did. I think the comparison with the Taiwan-Mainland China situation is flawed, because Taiwan is far, far smaller than China, and most Chinese are only dimly aware of it. North and South Korea are roughly equivalent in size however, and “reunification” is a much bigger deal to Koreans. If North Korea just becomes a poorer version of South Korea, its people might wonder what the point of its existence is.